You're mad as heck and you want to sue. We've all been there. But before you decide you want to sue someone, here are some things to consider. We'll look at the steps in a lawsuit and also some specific types of lawsuits. Civil lawsuits in which one party sues another work differently from criminal trials. This isn't Law and Order. Some civil lawsuits are tried before a jury, but many are tried before a judge. And many are settled out of court, to save money in legal fees and court costs. 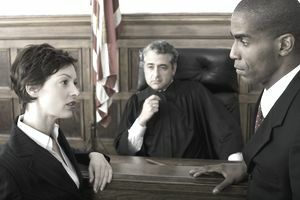 The most common type of civil lawsuit is a contract dispute. The two parties have a contract and one party breaches the contract (doesn't do what they said they would do). For example, an agreement to buy products or services is a contract, as is a contract for the sale of a business or an employment contract. A lease is also a contract and either party in the lease can sue the other. Other common types of civil lawsuits involve people who are harming you or your company in some way. Examples might be someone who is violating your company trademark or copyright, or who is defaming you or your business (libel or slander). Another example is a lawsuit against someone who is giving your business a bad review (yes, you may be able to sue in this case). While most employment lawsuits are against employers, you can sue an employee for such things as breach of contract and damages. If the amount of money is small, you may be able to take your case to a small claims court. Each state has specific dollar limits for small claims court. Who is it you want to sue? Is it a person, a business, or more than one? Knowing who you want to go after is important because it can determine the amount you may get from the lawsuit and the difficulty of suing that person or company. Can you find this person? What is the address of the person? If you can't find someone, it's difficult––and more costly––to start a lawsuit. How much do you expect to get from this lawsuit? Costs for any lawsuit involve court costs and legal fees. In small claims court, you may not need an attorney but there are still court costs to pay to file the lawsuit. If the costs are higher than the amount you might get, is it worth suing? What was the damage? How much did the other person cost you? Be realistic. If there was little damage, the amount you get won't be much. Can you reasonably expect to get your money from the defendant? In many small claims cases, the party that gets the judgment (the court's decision on the amount owed) has a difficult time getting the money because the defendant has nothing to give. Is the other party continuing to harm you or your business? You may need to get an injunction even before starting a lawsuit––or at the same time––to keep the other party from doing something to harm you. For example, in a trademark case, you might need to stop someone from using your company's trademark. An injunction is a court order, and you will need an attorney to create the injunction and get the court to enforce it. Determine who you are suing, as noted above. You will need to go through the process for all parties and the process must be followed for each party. Then find the right jurisdiction. You must figure out the court where the lawsuit must be tried. Jurisdiction may depend on where the defendant or the plaintiff lives or where the event took place. Jurisdiction may also be based on the type of case, like small claims, or the type of crime, like defamation. Jurisdiction gets complicated in internet lawsuits and in cases where there are multiple parties involved. Create a demand letter explaining your case and exactly what you want (usually in money). This letter is for the court and the defendant. Complete court forms and file your claim with the court. The forms and filing process depends on the jurisdiction. Court costs are involved here. Get a date on the court calendar. Serve papers on the defendant, including a summons to appear in court on the date set by the court and your demand letter. Usually, an officer of the court (a sheriff, for example) serves the papers. All of these steps are different depending on the jurisdiction and each party you are suing must have a copy of the demand letter and be served with papers. State laws usually apply, and every state has its own specific processes, forms, and court costs. You can find lots of websites that offer free legal forms for your state, but they rarely can cope with more complicated lawsuits. You may risk spending money only to find that something vital was missed. You can save money by doing these steps yourself, and you may be able to sue someone without an attorney, especially if you can use small claims court. But the more money involved and the more complex the case, the more you need an attorney. Try to find someone who is experienced in the type of law relating to your case (contract law, employment law, or labor law, for example) and someone who has experience with litigation (trying cases in court).